Chamber Blast fundraiser participants shoot at clay targets, above and top. 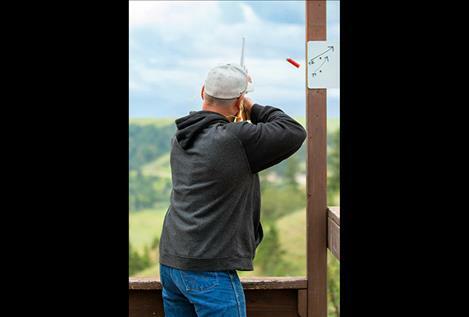 POLSON – Once the smoke settled and the earplugs were out, area shotgunners helped raise more than $4,000 during the Polson Chamber of Commerce 7th annual Chamber Blast hosted at the world-class Big Sky Sporting Clays on Friday. 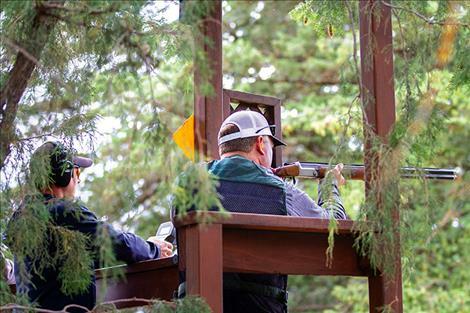 Sporting clays is often described as golf with a shotgun. Instead of holes, there are stations. Shooters only get two shotgun shells per station, so marksmanship is a must. The shooter is told ahead of time how many clay disks are going to be thrown and from where at each station. Then it’s up to the shooter to figure out how to hit them as they try to shoot amid trees and from extremely varied angles and distances. 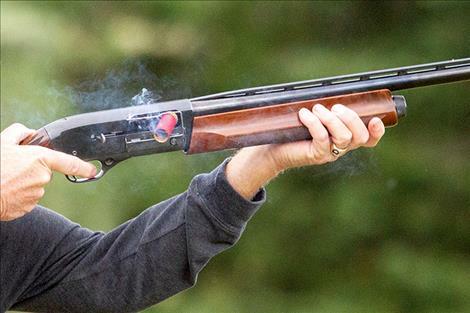 Unlike golf, the highest score wins in sporting clays. While the 12 teams of sporting clays shooters fired 100 shells at moving clay targets, the real aim was to help raise money for the Fourth of July fireworks show and hanging flower basket projects in Polson. According to event organizer David Lewing, the fireworks show and hanging flower baskets are a huge benefit for the whole community. The hanging flower baskets are one of those things downtown you would absolutely notice if they were not there, noted Lewing. “They give that little extra touch that makes our downtown look so nice,” he added. Team and individual high scores for the event include Cody Grant (score 86) with the highest overall individual score, runner-up Dennis Beams (score 82) and Samuel Cates (score 81). Shad Hupka, Shane Shima and Cody Grant of team First Interstate Bank won the overall team competition with a combined score of 211. Team Glacier Bank 2 (Dennis Beams, Butch Woolard, Terry Kramer) followed at 209 and team Cates Clay Crackers (Sam Cates, Samuel Cates, Payton Cates) placed third with 197. To learn more about the Polson Chamber of Commerce or upcoming events, check out the website at http://www.polsonchamber.com or contact the Chamber at 406-883-5969.